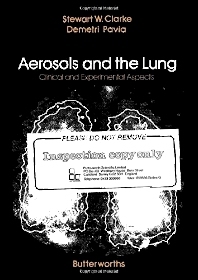 Aerosols and the Lung covers all aspects of aerosols and the lung, including the use of aerosol in clinical medicine. This volume was developed from the editors' longstanding interest in lung defenses coupled with the radioaerosol technique of assessing their efficiency. This book is organized into 11 chapters. The coverage of these chapters include the physical properties of aerosol required to evaluate their inhalation into the lung, production of aerosol that is suitable for inhalation, determination of aerosol deposition in the lungs and the assessment of lung clearance. This book also highlights the importance of radioaerosols in estimating airway calibre, in detecting airway disease and in ventilation imaging. This book will be of interest to medical students and professionals, particularly those dealing with studies of the human lungs and aerosols.